In the early 1940's a restaurant was opened near the site of the current Alpine Retreat, taking advantage of the proximity to Holy Hill and the picturesque setting. Known as The Old Frontier Inn, the country supper club began to prosper. The owners decided to add a horse stable so that diners could take rides around the beautiful countryside as their dinners were being prepared. After a short while, a new building was constructed at the present site of the Alpine Retreat. The property was purchased in 1941 by the Nencka family who restocked the horse corral and began to build their business until the outbreak of World War II changed their plans dramatically and put their business venture on hold. The Alpine Retreat was created at the Friess Lake Road location in July, 1950. Walter Nencka expanded the structure by adding on the current bar room, blending the new addition to match with the style of the existing dining room. For the next twenty years Walter would be the front of the operation, his wife Helen was cooking, and his daughter Sue worked as an all around assistant. After this impressive twenty years of service, the Nencka family decided to sell the Alpine Retreat to the Klemmer and Kools families. Additions were made by the new owners in 1971 and 1975, first enlarging the kitchen and then creating a new entrance that doubled as a coat room. As when Walter added the bar, great care was taken to blend these new additions to the artistic decor of the old building. One year later, in 1976 Maury Kools bought out William Klemmer's share of the restaurant. Maury took care of the front of the house while his wife Pat took over the cooking. After taking care of The Alpine Retreat for a period of thirty years, the restaurant was sold to C.J. Klemmer, Maury's nephew, and his wife Jean in 2002. Jean sadly passed away in 2006; C.J. 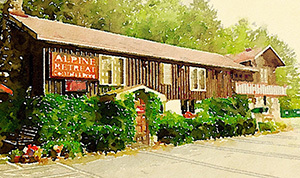 continued to operate the Alpine Retreat until 2011. The restaurant was purchased by Steve and Cindy Petrie in 2012. Former owners of the Alpine Village in Mequon for 25 years, Steve and Cindy thought they had left the restaurant business for good; however this was not to be. The quaint charm of the Alpine Retreat, so similar to that of the Alpine Village, brought back memories of the countless people who they had the pleasure of serving during their past career. After purchasing the Alpine Retreat, they worked to design a menu, blending the specialties perfected after many years by both restaurants. Alpine Retreat will continue to provide delicious, well prepared meals that have become the tradition of both restaurants. The employees of the Alpine Retreat send their most sincere invitation to join them and experience a wide menu stretching from savory burgers to the finest roast duck.